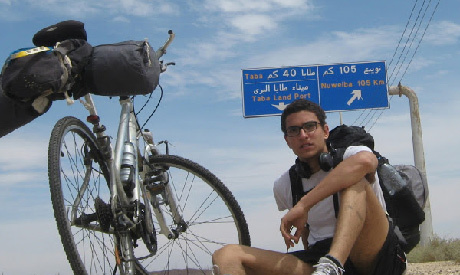 Galal Zekri Chatila is a young Egyptian who aims to cycle through every inch of his country, promoting positive values and encouraging his compatriots to venture beyond the Delta and discover the great outdoors. Zekri demonstrates an exceptionally optimistic and energetic attitude. He is a prime example of the many Egyptian adventurers who, although an inspiration for their generation, are seldom in the limelight. AO: How did you develop the passion for cycling? It started back when I was a kid. I was always dreaming. Whenever I was on the road with my family, I would imagine myself a traveller. My first hike was during a school camp to Suez (80km – 4 days). It gave me a new perspective; a glimpse of the fact all human beings are inherently decent and can be empowered by great objectives. I then wanted to join every single outdoor activity. When, the year after this camp, our school organised a cycling trip to Ismailia, I noticed for the first time that the bicycle can be a means of travelling. The following year I cycled there alone, then came the trips to Ain Sukhna and the Western Desert. AO: What or who was your inspiration? First and foremost, I was inspired by the human being himself and what he is made of. To name but a few of the many faces who inspired me: Into the Wild's Christopher McCandless, Mohamed Ouf (an older colleague who cycled to Nuweiba), and finally Omar Samra -- the first Egyptian and youngest Arab to climb Mount Everest -- for overcoming all his physical obstacles. These people demonstrated thinking outside of the box, but my main inspiration had always been the powers and capabilities possessed by humans. By believing in himself, having faith in his power, denying the impossible and calling on positive energies, every man can stand like an unbeatable monster and conquer his own fears. AO: Do you only cycle in Egypt? What routes are you dreaming of covering on your bike? Until now, I have only cycled in my beloved country. I refused all the opportunities to go on cycling tours abroad because I wanted to start my message from this great place, to give people hope in Egypt. I am not exactly sure if I would give my life for the road and tour the world one day, but what I am planning for now is to cover every single inch of my country by bicycle. AO: Do you see yourself always travelling alone? Have you thought about cooperating with other entities in the field like GBI (Global Biking Initiative) Cairo? So far, I see myself travelling solo, for a number of reasons: I love to have my own experience first then share it with others; also, as a sole traveller, I am better able to interact with people on the road. Maybe one day, when I decide to tour the world for peace, I will take a cyclist from each country. AO: What is the most intriguing experience you encountered during your trips? (Nuweiba) A police officer stopped me to advise me against heading to a certain village he said was full of thugs, but I continued on my road and the village was totally safe. I was even hosted at an ambulance point by a very kind man. (Oases) I had forgotten 300 LE at a police checkpoint. When I called a day later, a man told me he would verify when he returned to the checkpoint from his day off. The next morning, he called to say I had forgotten 400 LE not 300 LE and that he would mail them to me via the Egyptian post. The man paid some 10 LE out of his own pocket to deliver my cash. (Oases) While I cycled in the dark for the first time, a sandstorm blew me off balance and pushed me to the ground. I then realised I was too weak to fight against the force of nature. Luckily, I was hosted in a very old caravan – which seemed about to fly off the ground itself because of the sandstorm – by the middle of the road. (Oases) As I prepared to head back to Cairo, the oasis, saddened by my departure, decided to give me a great foggy morning. Visibility was barely 50 metres but, since I always love to try new things, I enjoyed cycling in the fog for about two or three hours. AO: Do you think circumstances in Egypt could be an obstacle, or a motivation, to your dreams? No they aren’t an obstacle, and never will be; trust me on that. When you get out of Cairo or away from the Nile, people start to change -- everyone is really good, and everyone is really caring. People are keen to take my phone number and keep in touch to make sure that I am okay and that I safely reached my destination. People who interact with nature most of the time are always good and kind, rather than people who are ruled by strict laws and orders in a society that always makes them feel unsafe and portrays the world as a dangerous place to live in. AO: Plans for the near future? To cycle around Egypt in five months (8000 km) -- the longest expedition around our beloved country. I am also planning on a new adventure this Easter; maybe kayaking from Aswan to Cairo. AO: And your ultimate goal is? To become an adventurer/traveller/filmmaker and to spread peace and love of nature through my films. I would also like to push people to their limits and to let them discover themselves by getting them out of the box. AO: How would you summarise your adventures? I am always exposed to nature, to good people; I get to know Egypt better every time. These adventures give me the chance to believe in what I am capable of doing, and make me see people from a different angle. What a glamour boy! I'm a German youngster of 68 and was riding my bicycle during a stay in Sinai in August 2013 and 2014 over only 550 km each. The distance was daily 30 km around a town in the very early morning. In that time a got to know the kindness of the Egyptian poeple and the spirit of that part of Egypt. I like it so much and hope to return as often as posible. Very inspiring amid all the gloominess and darkness of all news posted about Egypt. Thanks for sharing this story that brings in the light of hope to our lives. Is it safe out there to cycle around our be loving country EGYPT om el donia kolaha?